Back in June of 2016, I wrote a post called "Why do we do this anyway?" I had experienced a loss in the music ministry, and I was trying to sort through my feelings of regret in the face of it. 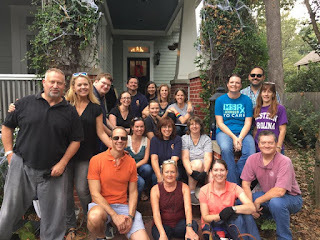 I realized this week that I mis-titled that post, or at least made questionable use of the editorial we, because in that post I wrote all about why I do this...and how I had wandered away from it. We are, after all, prone to wander. It's been a busy few weeks in music ministry at Decatur First. On October 1 we celebrated Music Sunday along with World Communion Sunday. 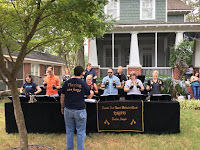 Within the two weeks that followed, our handbell choir went out and performed as part of the Oakhurst Porchfest, and then, just this past Sunday, we celebrated our Consecration Sunday during worship. Three major presentations in just two weeks, each with its own significant logistical challenges and each of which involved a whole lot of people working tirelessly to prepare and to perform. Honestly, by the time we all left the church on Sunday, I was thinking...why do we do this anyway? That's when I realized I had mistitled my article before. I mean, I know everyone is just like me, but I'm not sure everyone's in it for the same reasons I am. And it turns out, I discovered a little more about why I'm in it too. I talked a little about why we do this back on Music Sunday. It's because music offers us an opportunity to come together--to decide that there is something in this world worth giving ourselves to and to give ourselves to it. For us to sing as one, we have to check our egos at the door and seek to unify our sound in pitch, vowel, dynamic, and tempo. It's not that we sacrifice who we are and what makes us individual. Rather it is that we give all of our individual self to the common cause. And what a cause it was. A thing of true beauty. More than 180 individuals standing united to sing of Divine Love. One profound voice beckoning the Spirit into our troubled world. One Spirit longing to be changed from glory into Glory. I believe in the power of the written word, but believe me when I tell you there are no words to describe adequately the unadulterated power of so many coming together as voice and organ and bells filled the room and spilled into the street through front doors I'm convinced were blown open by the raw power of it all. Is that why we do it? Is it because our spirits long to sing in harmony--no, to be in harmony with those around us? I'm pretty sure that's part of it. That's why some of our most profound moments occur in rehearsal when we are our only audience (and of course the Christ in our midst!). But I'm not sure that's enough. We have something to say--a message and a mandate to share with others what it means to accept your role in the Body--as Bagger Vance said to "find your place in the field." Jesus showed us what it is to be in community and challenged us to share that with the world. 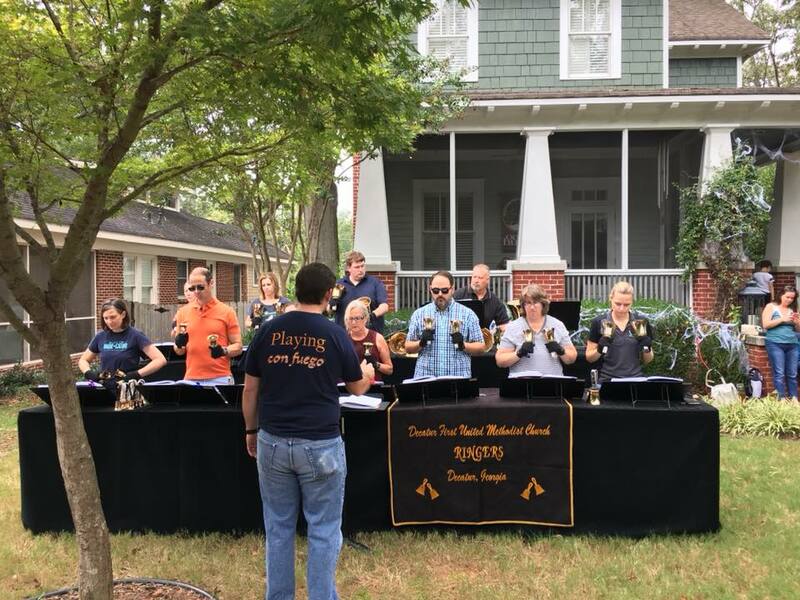 It's a little odd to think of playing at Porchfest as evangelism, but that is exactly what it was. We went out to make statements about what church is...and what it isn't (at least as far as we are concerned). At its best, church is all those things we explored on Music Sunday. It is Divine Love. It is not judgmental. It is not "envious or boastful or arrogant or rude." (1 Corinthians) It doesn't care if you have a beer. It doesn't care if you look alike or talk alike or have the same sexual orientation. Divine Love doesn't care what color you are. Shoot. In one of the greatest mysteries I've ever encountered, you're a part of this family even if you aren't a part of this family. Even if you don't want to be. Turns out there is nothing you can do to get out of it. That's some good news right there...but how can we share it? Maybe it looks something like this. We go outside. We partner with a stranger in Oakhurst. She doesn't say, "You kids get off my lawn!" We play. That's it. We just show everyone what it looks like. We have fun together. No it's more than that. We share this experience with each other. We laugh, yes. But we work too. We focus. We do all those things we did on Music Sunday, but we do them where someone else can see. It makes us vulnerable. Bells played in the open air are delicate and small and a window into the hearts of the ringers. Maybe that vulnerability is a strong voice after all. Another great mystery. It's a mystery spoken into eloquently and powerfully by Andrew Young. The Honorable Ambassador. The Pastor. "Andy." In a world alight with hate and discord, his message was that there is great hope...because we are the world. Fear is a passing thing, but God is eternal. He could have stood in our pulpit and talked about all he did. He has more stories and more to share from his 85 years than I would have in twice that many. He could have talked about his time with Dr. King. He could have talked about the Loraine Motel. He has seen so much suffering, and each of those stories would, by itself, have been compelling. If you didn't hear that sermon, stop what you are doing and go listen to it right now. A truly amazing testimony. And, standing just behind him, another testimony. A choir, again. Made up of youth and adults and senior adults. Individuals, all, but one in Spirit and one in call. Singing again with tremendous, unified power that we know we are prone to wander, prone to leave the God we love and, at the same time, imploring God to seal our hearts for God alone. Believing all the while not just that the Unclouded Day is possible, but that it is inevitable. Yes. That is why we do this. We know what it is to live and love in community. And we seek to share that love with others. Not out of judgment or arrogance, but out of the very same love. Because Divine Love is hope. It is a promise that God will keep...through us.